Saoussen Memmi has always understood that the biggest dreams can’t be reached in a single bound. Growing up in Tunisia, a small country in northern Africa, she focused on turning experiences into stepping stones for her next big opportunity. Memmi starts her journey by taking a risk and attending a brand-new university in Tunisia. In the back of her mind, she had a dream of pursuing a graduate degree in America. To do that, she needed to build her resume and set herself apart from all the other students with the same dream. She achieved her goal this year as a proud graduate of the CU Denver Business School. She was fully-funded as a Fulbright Scholar and even landed a one-year full-time job here in Denver before moving home to Tunisia. Memmi’s undergraduate institution was radically different from traditional Tunisian higher educational institutions. This university was the first to operate under the American system. A drastic shift away from the French system, the university changed up everything from class schedules to how lectures are run to the grading system. As a part of the first incoming class, she knew she was taking a calculated risk. While over 1,000 students were initially accepted into the program, only the top students succeeded. She was one of 82 students to graduate. Because of the school’s high standards for its students, is has become one of the top schools in Tunisia. Her risk paid off. As a Business Analytics major, Memmi took advantage of the entrepreneurial culture of the university. She had to build everything from the ground up, including a culture of student organizations. 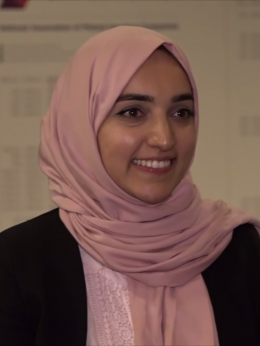 The Hult Prize competition was one of her personal passion projects. An international social entrepreneurship challenge, the Hult Prize’s focus is on launching disruptive social enterprises that solve the world’s biggest problems. Over 25,000 students across over 1,000 campuses pitch their startup ideas against each other, first regionally, then for the final competition at the United Nations headquarters in New York City for the million-dollar prize. After rallying together a team and competing in London, Memmi applied and became a Hult campus director. She wanted to bring this opportunity to every student at her university. The competition took off and spread to every Tunisian college. Memmi didn’t want to jump into a master’s degree right away, because she knew the value of having some experience under her belt. It was another way to continue building her resume before applying to a university in the United States. Another reason she didn’t jump straight into graduate school is one a lot of students can relate to. “I didn’t know exactly what I wanted to do,” she said. So, she accepted a full-time offer as a business consultant at Axe Finance, a company that does risk assessments for credit organizations. At Axe Finance she traveled to the Ivory Coast and UAE and interacted with people from a number of different nationalities. That job was also where she found her passion for information systems and risk management. After a couple of years with the company, she was finally ready to take the leap and apply for graduate school. She found her unicorn program here at CU Denver where she could combine both of her passions. The Master’s in Information Systems with a specialization in Enterprise Risk Management was her perfect fit. Memmi had heard about the Fulbright Scholarship program in her undergraduate program. As one of the most prestigious scholarships, the United States government fully funds a student’s graduate education. Memmi being interviewed at the 2017 NAMIC Conference. The Fulbright Scholarship was her ticket to the US. She knew she had to build her resume and show interest in international affairs, which is precisely what she had done through the Hult Prize and working for Axe Finance. Out of hundreds of Tunisian applicants, Memmi was among a dozen who received the award. At CU Denver, Memmi was happy to find that the classes and networking events exceeded her high expectations. She also appreciated the flexibility to pursue her interests from risk management and information systems. She related her coursework to her previous job and expanded on the foundation she had built at her job. “When I took the classes here, I started relating the work to my job,” Memmi shared. She had previously worked within specific software, but never understood why she was doing what she was doing until one of her courses laid it out for her. Memmi became very involved in the Information Systems Association (ISA), an active student club at the Business School, taking the role as president in her last semester. After falling in love with Denver, Memmi’s next goal was to stay longer and gain more experience in her field before heading back home to Tunisia. She took advantage of the Risk Management and Insurance program’s close ties to the industry, participating in a number of industry events to build her networking contacts. 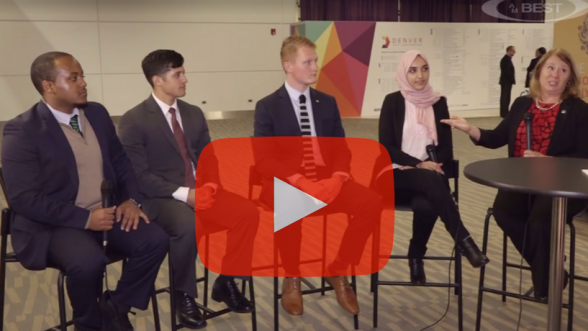 Last year, Memmi attended the annual National Association of Mutual Insurance Companies (NAMIC) conference, contributing as part of a small student panel. “Having the IT background added more depth. I was able to talk to future leaders in the industry about how the future of IT and risk management relate to each other,” she said. All of these experiences culminated in two impressive internships, one as a process improvement analyst with the Colorado Department of Energy, and then as a data analyst with the Denver City and County. Looking forward, she hopes to bring innovation and technology into the insurance industry through insurtech. She is also interested in working on cybersecurity issues to protect intellectual property and data, companies’ most valuable assets. Risk management is not well-established in Tunisia, so she knew she needed more experience before heading back to pioneer the movement back home. Under the requirements of the Fulbright Scholar, she was allowed to work for one year at a company before needing to return home. That made finding a full-time job offer incredibly difficult. Memmi defied those odds by dedicating herself to the job search and targeting startups more open to working with international students. “The startup mentality includes this belief that people can provide a lot of value, even in the short term,” she revealed. She ultimately received a full-time job offer as a data analyst with Pingora Asset Management, a specialized asset manager focused on investing in new production performing mortgage servicing. Memmi at a Spring Alternative Trip in Chicago. She volunteered with the WINGS and YWCA organizations. Memmi believes strongly in experiencing as much as possible in the time that we have. For international students far away from home, that means stepping out of their comfort zones to discover what they stand for and what they are truly passionate about. “I wanted this experience to be as valuable to my personal and professional life.” Living alone in the United States gave her another level of confidence she wouldn’t have gained. Memmi had to plan each step carefully to achieve her goals. But she’s not done yet. Her end goal out of all of her experiences to own her enterprise risk management company in Tunisia.